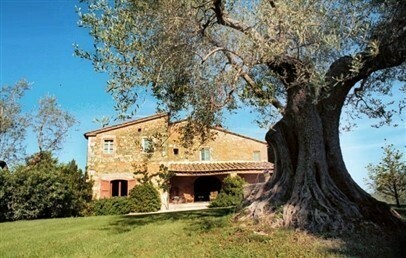 spend their holidays in the peace and quiet of the Tuscan countryside, without giving up to all the comfort. Guests can benefit of independent private apartments furnished in rustic style and equipped with a fireplace, and have access to the pool and barbecue for relaxing moments. Recommended for all ages, especially for families who wish to share a wonderful experience. A medieval hamlet in the gently, flourishing hills of Lucignano d'Asso, a nice town in the countryside of Siena, houses Borgo Lucignanello. It is a small world characterized by slow life, relaxing and panoramic country roads, peace, quiet and first of all, it presents the fascinating atmosphere of ancient time. By car you can easily reach San Giovanni d'Asso, Siena, Montalcino, Montepulciano, Bagno Vignoni, Cortona and Pienza. The nearest airport is in Florence approx. 120 km distance. 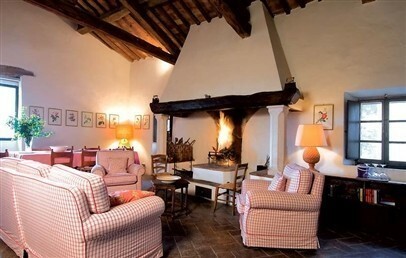 Borgo Lucignanello has been the property of the family Piccolomini who take care of it for hundreds years. The hamlet has been recently restored by the architect Paolo Alberto Rossi and it features a marked typical tuscan rustic style. The five apartments and the farmhouse exploit the building's original spaces characterized by travertine, the terracotta and seasoned wood, delicate trompe-l'oeil motifs, hand-painted ceramics, hessian, canvas and cotton. 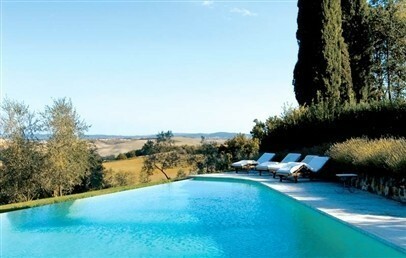 The Borgo consists also of a panoramic infinity swimming pool and a sun bathing terrace, a wine bar and a little grocer's shop. The apartments are independent and equipped with modern amenities, facilities and technologies, internet connection Wi-Fi. 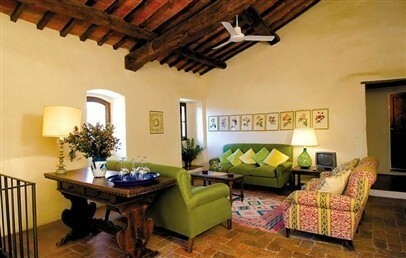 The apartments and the farmhouse of Lucignanello have different sizes and can accommodate up to 7 people. Casa Maria (70 sqm) is ideal for 3 people. 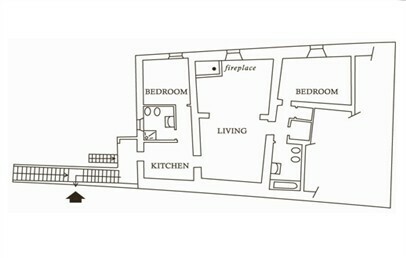 It consists of two bedrooms, bathroom, living room, kitchen and private garden. 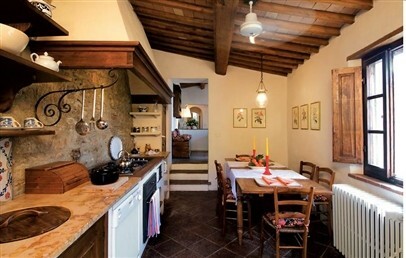 Casa Severino (130 sqm) is ideal for 4 people. It consists of two bedrooms, living room, two bathrooms and private garden. 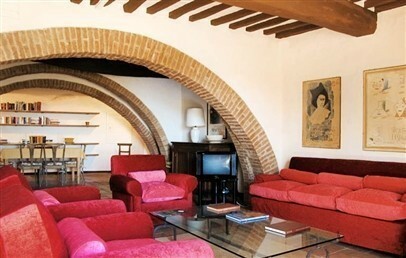 Casa Remo (130 sqm) is ideal for 4 people. It consists of two bedrooms, living room, dining room, kitchen and two bathrooms. Casa Clementina (140 sqm) is ideal for 4/5 people. Spread over two floors, it consists of 2 bedrooms, living room with sofa bed for the 5th person, kitchen and two bathrooms. Casa Amedeo (185 sqm) is ideal for 4/6 people. It consists of two bedrooms, a living room which is accessed by a spiral staircase, kitchen and two bathrooms. The 5th and 6th person do sleep in two additional beds. 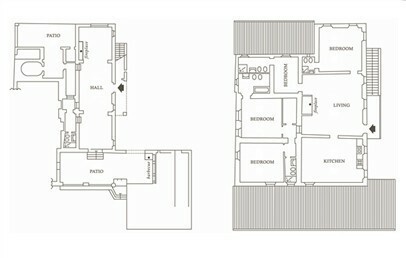 Casale Sarageto (325 sqm) is ideal for 7/8 people. Spread over two levels, it consists of 4 bedrooms, sitting area, kitchen, living room, 5 bathrooms and two patio. It is surrounded by a large garden with swimming pool. Additional costs to be paid on-site: Heating (approx. € 3,90 x m3), daily cleaning, change of linen and towels during the week, laundry service, breakfast service, private cook. Each apartment has its own kitchen, fully equipped with coffee machine, microwave, electric oven and dishwasher. There are several restaurants and bars in the nearby of the Borgo and the staff will be at your disposal for suggestions and reservations. 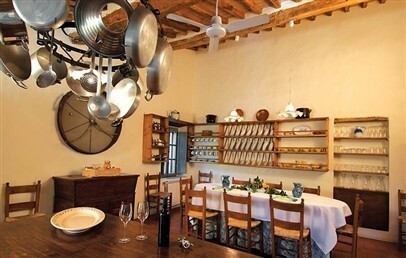 Your holiday in Tuscany at the Borgo Lucignanello will be complete by a number of activities such as cooking classes, truffle hunting, wine tasting and horse riding around the countryside. You have also the chance to enjoy the panorama from a hot air balloon, visit the nearby towns and take part in festivals and fairs, and finally, relax yourself at the Bagno Vignoni Spa’s waters. 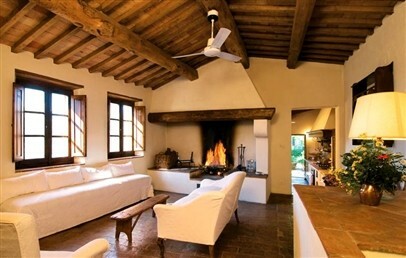 Located in the first part of the Borgo, precisely at the ground floor of Casa Maria, Casa Severino features a marked rustic style and provides all modern comforts. 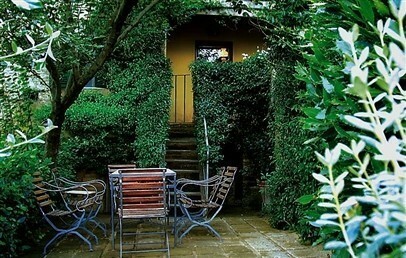 It is particularly ideal in summertime because it is the coolest and most shady of all those in the borgo. It consists of a double bedroom and a twin bedroom; living room with fireplace and fully equipped kitchen with coffee machine, microwave, electric oven, dishwasher and internet Wi-Fi. The two bathrooms have the shower or the tub. 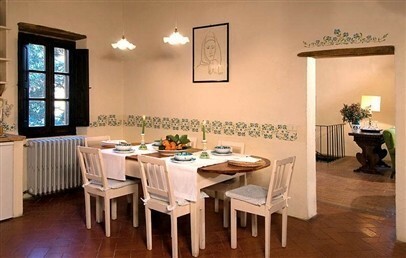 Casa Severino has an independent entrance and a private little garden with table and chairs. The bedrooms windows offer a relaxing hills view. 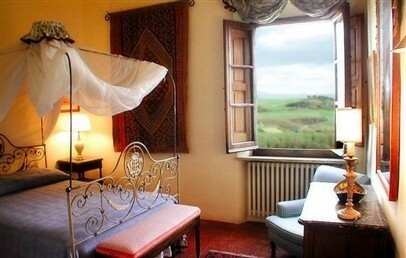 Intimate and romantic, Casa Maria is characterized by ancient furniture, typical of Tuscan country tradition. Comprised a master bed room with queen size four poster bed and a second one with twin beds. The living room presents a fascinating fireplace and the kitchen is equipped with all modern comforts and internet Wi-Fi. The bathrooms has the shower. Casa Maria has an independent entrance and a private little garden with al fresco area identified by roses covered pergola. Thanks to its panoramic position, the apartment offers a beautiful Tuscan hills view. 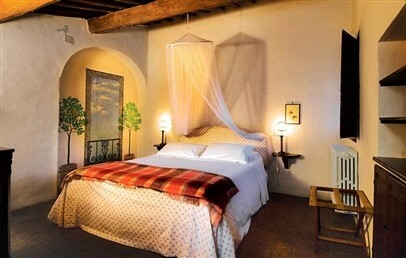 Spacious and comfortable, Casa Remo is characterized by ancient frescoes and motifs by well-known artists. It consists of double bedroom and twin bedroom; large living room with wall fireplace, dining area with Montalcino view and fully equipped kitchen and internet connection Wi-Fi. The two bathrooms have the shower or the tub. Casa Remo faces the courtyard of the church and offers a relaxing hill view. 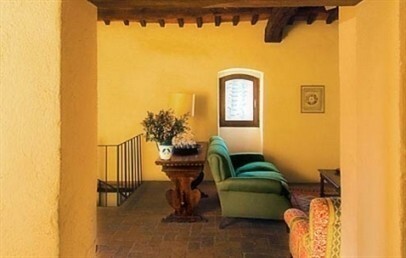 Casa Clementina is located in the Tiglio square and it is characterized by precious ancient details, marked rustic style, a typical Florence fireplace and ancient frescoes. 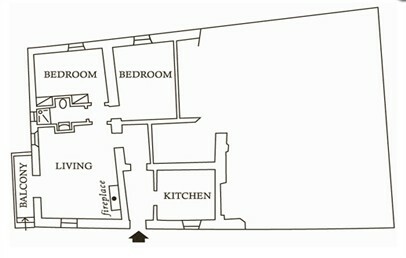 At the first floor there are a double bedroom, a twin bedroom and a bathroom with shower. The ground floor presents a large living room with fireplace and sofa bed, a kitchen characterized by local travertine and ancient hand-painted tiles and a second bathroom with bathtub. The living room and the kitchen overlook the countryside while the bedrooms face the square. Casale Sarageto is located 300 m far away from the borgo. Recently renovated, it is characterized by an original and welcoming country style. Spread out on two level, it presents on the 1st floor a central sitting room with fireplace, a fully equipped kitchen-with dining room, one double bedroom, two twin bedrooms and a single bedroom. Each one have their own en-suite bathroom with shower (one has a tub). The ground floor consists of large living room, one bathroom with shower, two patio with oven, BBQ area, ping pong table and internet connection Wi-Fi. The house has an independent entrance, a large garden with swimming pool and offers on both sides a countryside view. Located on the centre of the Borgo, Casa Amedeo is characterized by precious ancient details, marked rustic style, a typical Florence fireplace and ancient frescoes. It consists of a double bedroom and a twin bedroom that, on request, can be transformed into an additional double bedroom. A spiral staircase leads to a sitting room which presents 2 additional single beds. 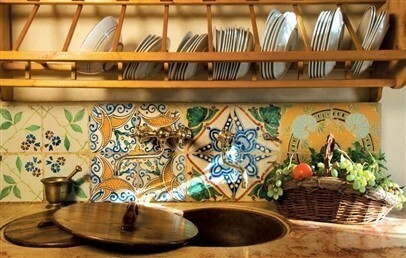 The kitchen features a traditional Tuscan fireplace which encompasses an entire wall of the room. Internet connection Wi-Fi. There are 2 bathroom, one has a shower, one the bathtub. Casa Amedeo offers a typical roofs view. Special for Charming's customers: one bio olive oil tasting!